MTN Nigeria has quietly launched another video streaming package which enables you to stream and download. The new MTN YouTube Video streaming pack is a time-based data plan that allows you to watch videos on YouTube on any smartphone as low as N50 only. 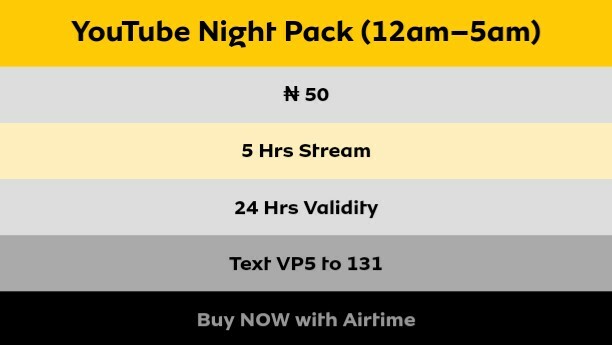 The New MTN Youtube video streaming package gives you a big chance to stream any video on Youtube for 5 good hours which is between 12am till 5am in the morning for just N50 only. The MTN Youtube Night Video plan can only work on youtube mobile app and Playstore only. 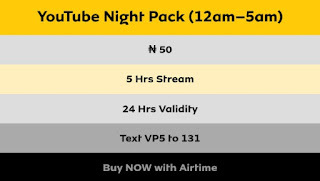 The MTN Youtube Night is easy to activate on any phone, But before activating this package on your smartphone, Please make sure there's an MTN Sim on the phone with a minimum recharge of N50 only before proceeding to the next level. To Activate the MTN Youtube Night Video Plan kindly Text VP5 TO 131 as Text Message and N50 will be deducted instantly from your MTN Sim within 20sec.